Recent reports that the F/A-18F Super Hornet has been arbitrarily chosen as an interim fighter for the RAAF have raised considerable interest in the capabilities of this evolved third generation fighter, relative to the Russian Flanker. This analysis will test the Super Hornet against its most likely opponent in the region, the Sukhoi Flanker. The Super Hornet is the follow-on to the 'Classic' Hornet, and is at this time flown only by the US Navy. It was blooded during Operation Southern Watch and used during the invasion of Iraq, primarily flown in battlefield interdiction and close air support roles, where it has proven more effective than the 'Classic' Hornet. The Super Hornet is what the 'Classic' Hornet was initially intended to be, when the VFAX program which led to the F/A-18A/B was launched during the early 1970s. The aim was a multirole fighter to replace the A-4 Skyhawk, A-7 Corsair II and the F-4 Phantom. Bureaucratic 'optimisation' resulted in the 'Classic' Hornet, rather than the F-15A sized VFAX as intended. The origins of the Super Hornet are in the period following the end of the Cold War, when collapsing budgets saw the US Navy role away from blue water sea control operations, to littoral 'gunboat diplomacy' in global trouble spots. Since 911 this has been the dominant role of the US Navy. With catastrophically declining funding the US Navy could not buy more F-14Ds, and needed something larger than the 'Classic' Hornet, which proved too small to be effective and demanding of aerial refuelling support. The intended replacement for the F-14, the Navy Advanced Tactical Fighter, a 'swing wing' F-22 derivative, was too expensive for the downsized US Navy budget. The retirement of the A-6 Intruder and KA-6D tanker during this period further exacerbated the US Navy's woes. 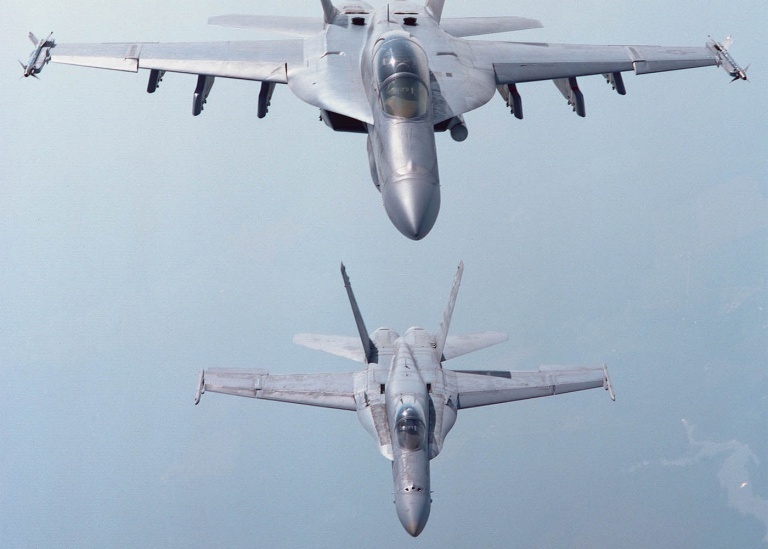 Legislation mandated a full flyoff competition for a new fighter, and the Navy thus manoeuvred around this by seeking a redesign of the existing 'Classic' Hornet . The Super Hornet is substantially a new aircraft, which shares only limited structural commonality with the F/A-18A-D family of fighters. While the F/A-18E/F forward fuselage is derived from the F/A-18C design, the wing, centre and aft fuselage, tail surfaces and powerplants are entirely new. The baseline avionic system is however largely derived from the F/A-18C, with planned growth through further evolved derivatives of the radar, EW and core avionic systems, and entirely new systems where appropriate. The designation F/A-18E/F reflects the fact that the aircraft is derived from the F/A-18A-D, even if it is a significantly larger airframe design - the program was implemented as an Engineering Change Proposal (ECP) to avoid a costly demonstration program and fly-off. A side effect of this idiosyncrasy in nomenclature is that the F/A-18E/F is frequently dismissed as just another Hornet, yet the aircraft is very different in many respects. From a design perspective, the most notable change in the Super Hornet is its size, designed around an internal fuel (JP5) capacity of 14,700 lb, or 36% more than the F/A-18C/E. This most closely compares to the clean F-15C, which has around 10% less internal fuel than the Super Hornet. Sizing around a 36% greater internal fuel load than the F/A-18C, with the aim of retaining the established agility performance of the F/A-18C, resulted in a larger wing of 500 sqft area, against the 400 sqft area of the F/A-18C, a 25% increase. The consequent sizing changes result in a 30,885 lb empty weight (31,500 lb basic weight) aircraft, a 30% increase against the F/A-18C. Not surprisingly, the aircraft's empty weight is 8% greater than the F-15C, reflecting the structural realities of catapult launches and tailhook recoveries. The larger F414 engine, a refanned and evolved F404 derivative, delivers 20,700 lb static SL thrust in afterburner, which is around 8% less than the F100-PW-220 in the F-15C. The simplest metric of the F/A-18E/F is that it is an F-15A-D sized F/A-18C derivative, optimised for the naval environment. Size is where the similarity between the Super Hornet and Eagle end, since the Super Hornet is optimised aerodynamically around the F/A-18A-D configuration, with a focus on transonic manoeuvre and load carrying performance, and carrier recovery characteristics. In terms of raw performance, the Super Hornet is very similar to the F/A-18C, but provides significantly better CAP endurance and operating radius by virtue of its larger wing and internal fuel load. With three 480 USG drop tanks, full internal fuel, combat and reserve fuel allowances, 8 x AIM-120 AMRAAMs and 2 x AIM-9 Sidewinders, the aircraft has a point intercept radius cited in excess of 650 NMI, with some assumptions made about expended missiles. This is radius performance in the class of the clean F-15C. Like the F/A-18A-D, the F/A-18E/F was designed from the outset for a dual role fighter bomber mission environment. The enlarged wings have three hardpoints each, typically loaded with a pair of 480 USG tanks inboard and weapons on the pair of outboard stations. The wingtip Sidewinder rail is retained. A notable aerodynamic feature is a significantly enlarged strake design over the baseline Hornet, intended to improve vortex lifting characteristics in high AoA manoeuvre, and reduce the static stability margin to enhance pitching characteristics - Boeing cite pitch rates in excess of 40 degrees per second. Structurally the Super Hornet is built largely from aluminium alloys, with extensive use of carbon fibre composite skins in the wings, and titanium in several critical areas. The design load factor limit of 7.5G is identical to the F/A-18A-D, at an unspecified gross weight. Until recently, Super Hornets were delivered with the Raytheon APG-73 radar, not unlike the F/A-18A/B HUG radar. 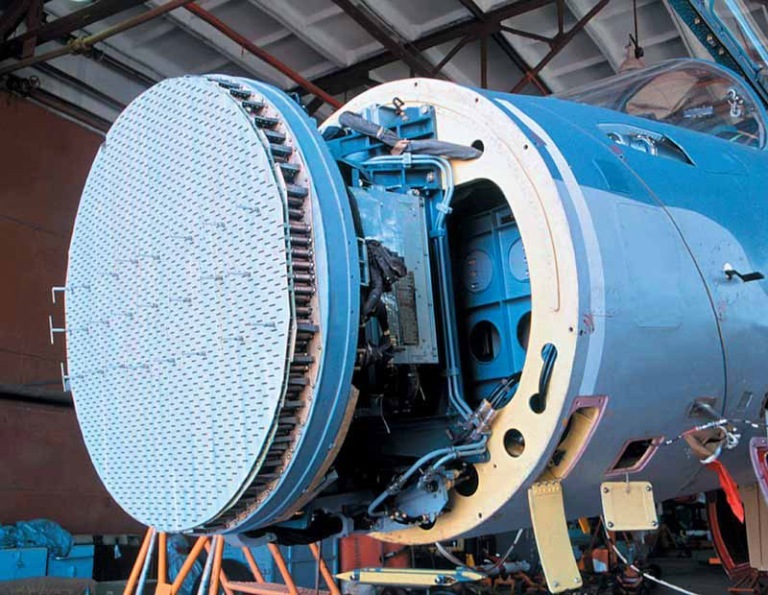 Most recent deliveries see the new APG-79 Active Electronically Steered Array (AESA) radar fitted. 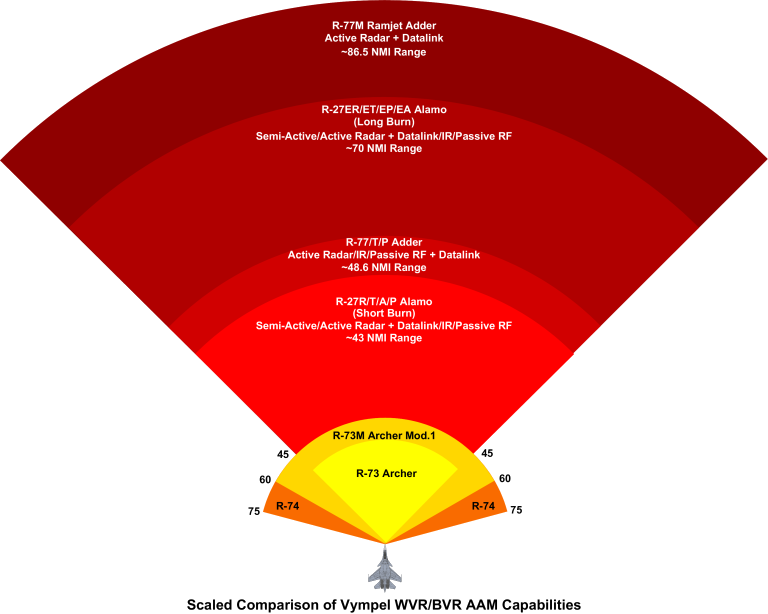 The APG-79 is considered to have slightly better range performance than the Joint strike Fighter's APG-81 AESA, but inferior to the F-22A's larger APG-77. The Super Hornet is fitted with a new AN/ALQ-124 Integrated Defensive Countermeasures system (IDECM) EWSP system, including the ALE-50 towed decoy, more capable than the legacy package in US or RAAF 'Classic' Hornets. There is thus little commonality between the Super Hornet and 'Classic' Hornet variants. Notes: O/B - seeker off-boresight acquisition angle; IRH - heatseeking, single or dual colour scanning seeker; SARH - semi-active radar homing seeker; DL - datalink for midcourse guidance corrections - either analogue or digital; IMU - inertial package for midcourse guidance; Passive RF - passive radio frequency anti-radiation seeker; ARH - active radar homing seeker; Acquisition Range is that at which the seeker can acquire its target; Kinematic Range is A-pole or F-pole; Target G - max load factor of target vehicle; Launch G - max load factor of launch aircraft; APU - Aviatsionnaya Puskovaya Ustanovka (rail launcher); AKU - Aviatsionnaya Katapultnaya Ustanovka (ejector); This is a current open source compilation based on manufacturers' and third party data therefore figures should be treated with appropriate caution (Author). To make a comparison between the Super Hornet and Flanker, it is necessary to explore the kind of air combat we will see in the region over coming years. Aerial combat between fighters has seen considerable evolution since the 1940s, driven in part by weapons technology, in part by sensor technology and in part by airframe aerodynamic performance. The last two decades have seen two important trends. The first is the ascendancy of Beyond Visual Range (BVR) combat, as advances in sensors have permitted long range missile engagements with increasing confidence that the target is indeed a hostile. The second trend has been the proliferation of extremely agile heatseeking missiles for close combat, and associated Helmet Mounted Displays or Sights. The effectiveness and lethality of fourth generation heatseeking missiles makes close combat with a situationally aware opponent a high risk game. 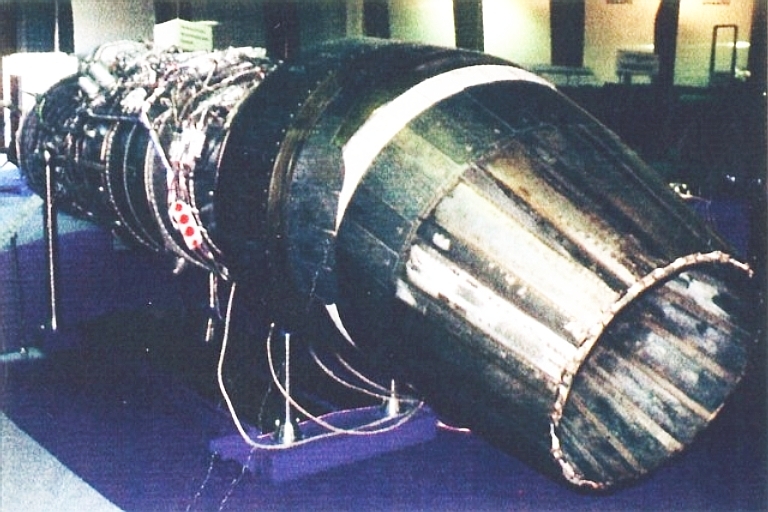 Missiles such as the AIM-9X, ASRAAM, Python 4 and 5, Iris T, R-73 and R-74 give no quarter, and with exceptional G capability, often aided by Thrust Vector Control (TVC), these missiles are almost impossible to defeat by manoeuvre. Increasingly such missiles are acquiring Focal Plane Array imaging seekers, supplanting the scanning seekers dominant for decades, making them virtually immune to flares and jammers developed to defeat scanning seekers. Whoever takes the first shot in a close in engagement most likely wins. Does this preclude close combat in the future? Only in the minds of those observers who imagine that all future aerial conflict will be highly assymetric, not unlike the Desert Storm, Allied Force and Iraqi Freedom air campaigns. Reality is somewhat different. In global terms, most modern fighter aircraft are today being purchased by nations in the Pacific-Rim and South Asian regions. These nations are mostly building modern force structures for their air forces, including Airborne Early Warning and Control (AEW&C) aircraft, tanker aircraft, passive electronic surveillance and intelligence aircraft (Intelligence Surveillance Reconnaissance – ISR), and most likely in coming years, stand off support jamming aircraft. Datalinking and networking is increasing available. The United States, or US aligned nations will thus confront an environment which is at best asymmetric in the quality of specific force structure components, but not asymmetric in force structure, like the air campaigns of the 1990s. 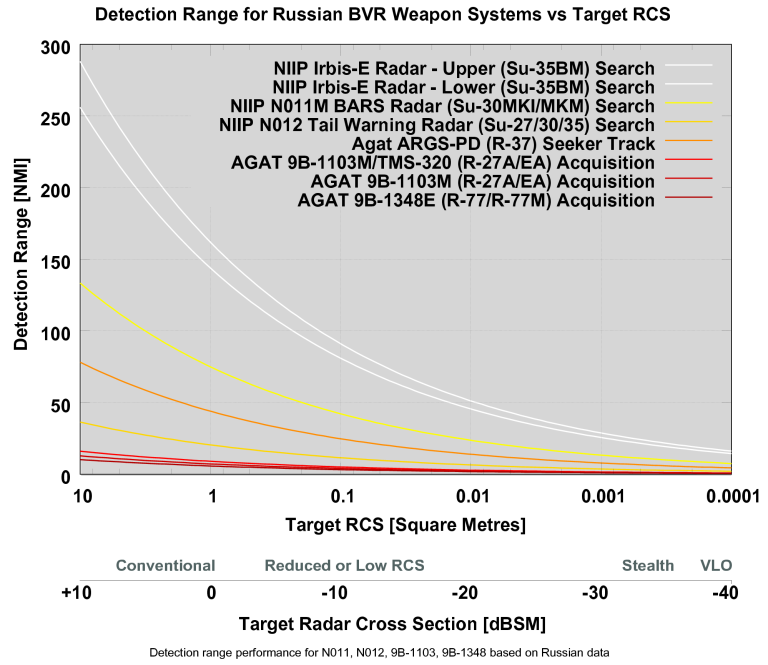 The dominance of BVR combat is contingent on having what amounts to 'information superiority', or what is an asymmetric advantage in 'big picture' situational awareness. Once both sides operate AEW&C, passive ISR, networks and high power support jammers, the 'fog of war' yet again re-emerges, as sensors are degraded or blinded, networks and datalinks degrade or drop out, and a clear picture of the battlespace is again difficult to acquire. In this sense, the uncontested dominance of BVR combat will only last as long as it takes for the key force multipliers to become more widely available to non US-aligned air forces. The proliferation of 100 to 200 nautical mile range “counter-ISR” missiles like the Russian R-172, R-37 and Kh-31 variants add yet another variable to this mix. This is the future air combat environment, where information is the new high ground, and being where one is not expected to be is increasingly valuable. In comparing the Super Hornet and the Flanker, we must be mindful of the environment they will operate in. The notion that these two types will be flown against each other in the asymmetric world of the 1990s is at best naïve, at worst foolish. In assessing the Flanker against the Super Hornet it is clear from the outset that the advantage in firepower, speed, raw agility, range and manoeuvre performance goes to the Flanker. Given that operational Flankers span variants from B through H, and type designations from Su-27S, through Su-30s to Su-35s, there are a wide range of configurations possible. This has been further complicated by the Russian propensity to customise configurations for clients, and perform ongoing technology upgrades to operational variants. Another byproduct of Russian marketing is that the label Su-30 spans an upgraded Su-27SKM (Su-30KI) up to the Indian Su-30MKI, which uses extensive ly features demonstrated in the Su-37. In terms of aerodynamic performance the Flanker sits broadly in the class of the F-15 family, with similar thrust / weight ratios at similar weights. The empty weight of Flanker variants ranges between 37,240 - 40,800 lb and internal fuel capacities between 20,750 - 22,600 lb. At this time all production Flankers are flying with variants of the Saturn/Salyut Al-31F, which deliver static sea level thrust ratings in the 27 klb to 32 klb class, depending on the variant. This engine is comparable to the latest P&W F100 and GE F110 series engines, outperforming the smaller F404 series. In terms of supersonic speed, supersonic and subsonic acceleration and climb performance, the Super Hornet cannot compete with any Flanker variant. High speed turning performance, where thrust limited, also goes to the Flanker, as does supersonic manoeuvre performance. The Super Hornet is severely handicapped by its lower combat thrust/weight ratio, and hybrid wing planform. 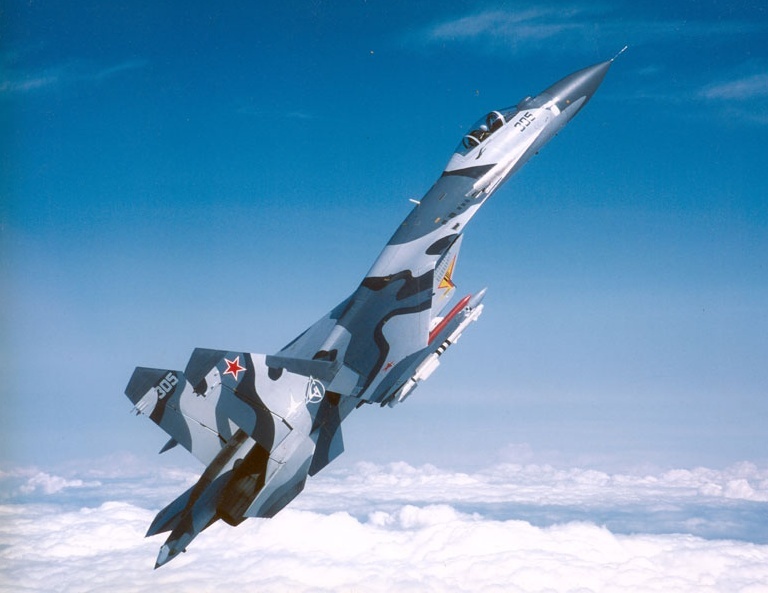 It is worth observing that high alpha trim drag and pitch rates of the canard equipped Flanker variants, such as the Su-33 and Su-30MKI, will be superior to the versions without canards. Where the Super Hornet is apt to be more competitive against the Flanker is in the near stall low speed high alpha flight regimes, where the Super Hornet's strakes and wing work well and advanced flight controls perform superbly. This is however not a regime favoured by combat pilots and thus not of significance in an assessment of combat potential. The big gain in coming years for the Flanker in relative performance come with the new Al-41F engine, Russia's F119, now in Low Rate Initial Production (LRIP). The Al-41F delivers up to 40 klb class sea level static thrust, and high altitude dry thrust ratings to power the defunct supercruising MFI (Multi-Role Fighter). The Russians have been flying derated 33 klb Al-41Fs in a Su-27S since 2004. With Al-41F engines installed the Flanker's robust margin in kinematic performance against the Super Hornet grows considerably in all regimes of flight – it provides the Flanker with 'F-22-like' raw agility and performance. With wing sweep, planform, forebody shaping and inlets built for Mach 2+ dash, a clean Flanker with Al-41Fs should supercruise effectively. A supercruising Flanker with TVC nozzles, ie AL-41FU, can use downward TVC to offset supersonic trim drag and thus achieve lower fuel burn in this regime. However, its supersonic energy bleed performance may not measure up to the refined design of the newer supercruise optimised designs, such as the F-22 or MFI. The bigger issue for the Flanker in supercruise is the drag of external stores, which will compromise it decisively against an optimsied design in supersonic combat. The fix for this limitation is a centreline tunnel conformal weapons pod for the R-74 and R-77 family AAMs. If and when reports of such a design emerge, we can be certain that Sukhoi are planning to play the supercruise game in earnest. In terms of combat radius performance the Flanker outperforms the Super Hornet, even with the latter carrying external tanks. There is no substitute for clean internal fuel. The Flanker's radar aperture is twice the size of the Hornet family apertures, due to the larger nose cross section. 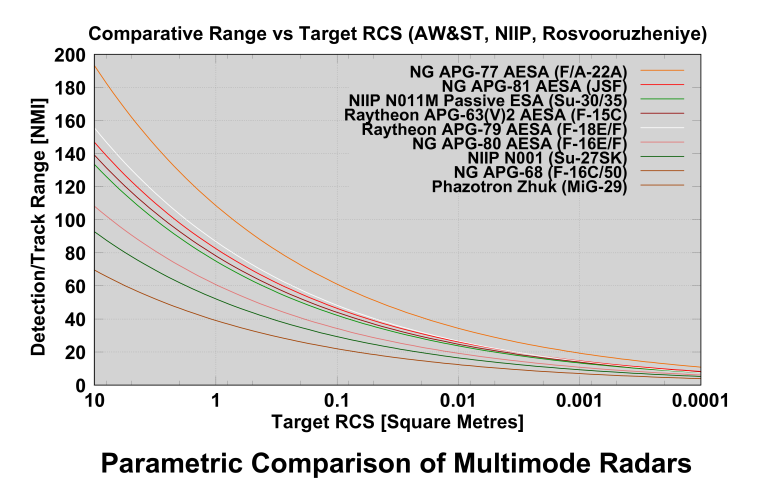 The APG-79 provides comparable range performance to the JSF APG-81, making it inferior to the F-22A's APG-77, but better than in service Flanker radars. The most capable radar in an operational Flanker is the NIIP N-011M BARS, a hybrid passive ESA design using a backplane feed and a range of transmitter tubes with varying peak power ratings. 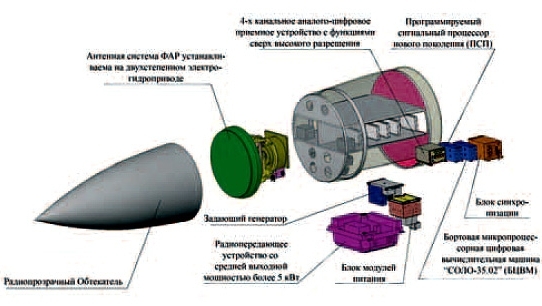 The hybird design provides equally good receiver sensitivity to Western AESA designs (Irkut). In terms of radar capabilities, existing Flankers are equipped mostly with variants of N-001, comparable to early F-15 APG-63s. The Su-35 carries the N-011, closer to a late model APG-63/70, and the Su-30MKI the NIIP N-011M BARS which is a hybrid phased array closest in technology to the much smaller RBE2 in the Rafale. The BARS can be supplied with a range of Travelling Wave Tube (TWT) power ratings, but cannot compete with the Super Hornet's liquid cooled APG-79 AESA. 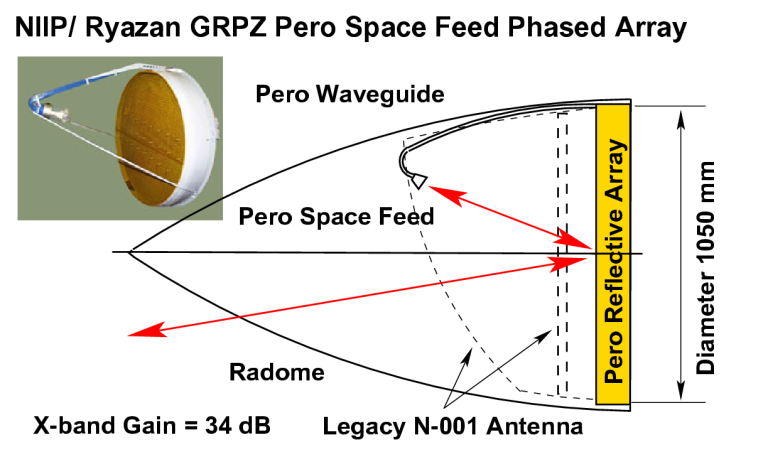 The new Pero N-001 antenna upgrade package, using a space feed reflective passive phased array, is apt to have much better peak power handling potential to the BARS, in a much cheaper design, but is yet to enter production. The PLA is reported to have been evaluating one fo two prototypes. A major concern is that a low loss waveguide feed suitable for very high peak and average power levels is easily integrated in a space feed arrangement of this type, and thus a peak power rating exceeding that of the APG-79 is not that difficult to effect, TWT performance permitting. Cooling is not an issue in an airframe the size of the Flanker. NIIP and Phazotron are known to have been working on an AESA design, and given the aperture size of the Flanker, an AESA radar in the power-aperture rating class of the F-22's APG-77 is a distinct possibility for a post 2010 Flanker. 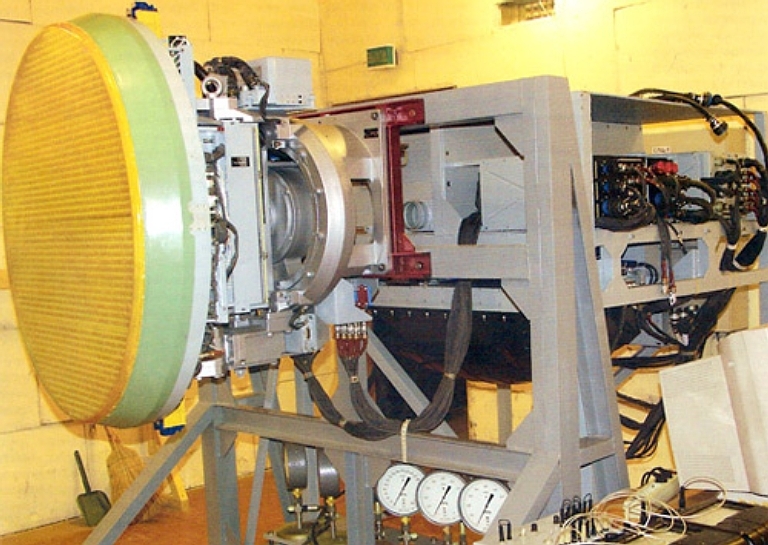 The only issue for the Russian radar houses will be the availability of Gallium Arsenide HEMT (High Electron Mobility Transistor) transistors for the radar modules. 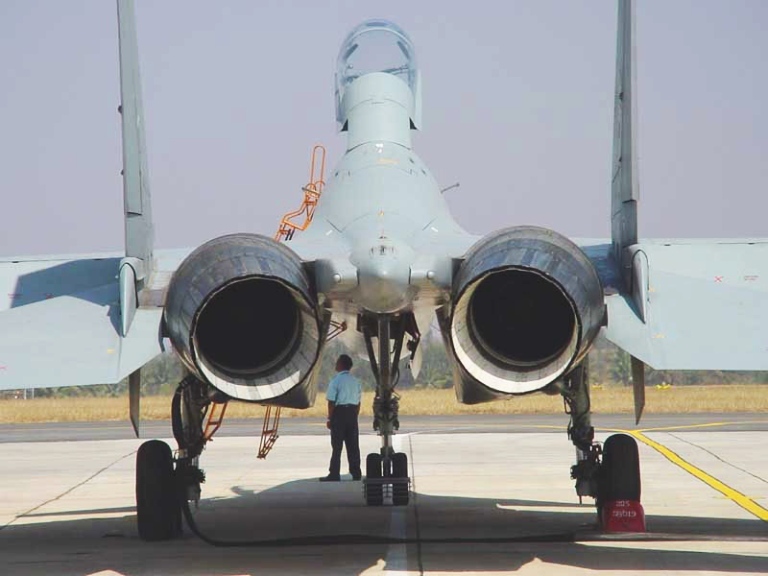 Compared to the Super Hornet's APG-79, a Flanker sized AESA even with inferior radar module performance can match the power-aperture rating and thus range of the APG-79. The baseline N011M radar uses a vertically polarised 0.9 metre diameter aperture hybrid phased array, with individual per element receive path low noise amplifiers delivering a noise figure cited at 3 dB, similar to an AESA. Three receiver channels are used, one presumably for sidelobe blanking and ECCM. The EGSP-6A transmitter uses a single Chelnok Travelling Wave Tube, available in variants with peak power ratings between 4 and 7 kiloWatts, and CW illumination at 1 kW. Cited detection range for a closing target (High PRF) is up to 76 NMI, for a receding target up to 50 NMI. The phased array can electronically steer the mainlobe through +/-70 degrees in azimuth and +/-40 degrees in elevation. The whole array can be further steered mechanically. Polarisation can be switched by 90 degrees for surface search modes. The follow on to the BARS is the new Irbis-E (Snow Leopard) hybrid phased array, in development since 2004 and planned for the Su-35 block upgrade, and as a block upgrade or new build radar for other Flanker variants. The Irbis-E is an evolution of the BARS design, but significantly more powerful. While the hybrid phased array antenna is retained, the noise figure is slightly worse at 3.5 dB, but the receiver has four rather than three discrete channels. The biggest change is in the EGSP-27 transmitter, where the single 7 kiloWatt peak power rated Chelnok TWT is replaced with a pair of 10 kiloWatt peak power rated Chelnok tubes, ganged to provide a total peak power rating of 20 kiloWatts. The radar is cited at an average power rating of 5 kiloWatts, with 2 kiloWatts CW rating for illumination. NIIP claim twice the bandwidth and improved frequency agility over the BARS, and better ECCM capability. The Irbis-E has new Solo-35.01 digital signal processor hardware and Solo-35.02 data processor, but retains receiver hardware, the master oscillator and exciter of the BARS. A prototype has been in flight test since late 2005. The performance increase in the Irbis-E is commensurate with the increased transmitter rating, and NIIP claim a detection range for a closing 3 square metre coaltitude target of 190 - 215 NMI (350-400 km), and the ability to detect a closing 0.01 square metre target at ~50 NMI (90 km). In Track While Scan (TWS) mode the radar can handle 30 targets simultaneously, and provide guidance for two simultaneous shots using a semi-active missile like the R-27 series, or eight simultaneous shots using an active missile like the RVV-AE/R-77 or ramjet RVV-AE-PD/R-77M. The Irbis-E was clearly designed to support the ramjet RVV-AE-PD/R-77M missile in BVR combat against reduced signature Western fighters like the Block II Super Hornet or Eurofighter Typhoon. Curiously, NIIP do not claim superiority over the F-22A's APG-77 AESA, yet their cited performance figures exceed the public (and no doubt heavily sanitised) range figures for the APG-77. The existing N011M series lacks a Low Probability of Intercept capability, in part due to antenna bandwidth limits and in part due to processor limitations. This is likely to change over the coming decade, with the Irbis-E, as customers demand an ability to defeat or degrade Western ESM equipment and the technology to do this becomes more accessible. The N012 tail warning radar has been reported to be part of the Su-30MKI suite and is offered as a retrofit to other models. The IDECM EWSP suite on the Super Hornet is more advanced than the EWSP suites on older Flanker variants. Defensive systems include a Radar Warning Receiver, mostly variants of the SPO-32 / L150 Pastel digital receiver carried. Newer Flankers however carry the podded wingtip mounted KNIRTI SPS-171 / L005S Sorbtsiya-S mid/high band defensive jammer, this system being an evolution of a jammer developed for the Backfire C. The Sorbtsiya-S, unlike most Western jamming pods, is designed to operate in pairs and uses forward and aft looking steerable wideband phased arrays to maximise jamming effect. It is worth observing that the Sorbtsiya is clearly built to provide cross-eye jamming modes against monopulse threats, and the wideband mainlobe steering capability provided by the phased array permits best possible utilisation of available jamming power. 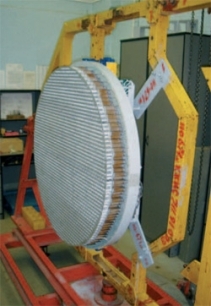 A graded dielectric lens is employed. Russian contractors have been using Digital RF Memory (DRFM) technology, which is of the same generation as Super Hornet EWSP. The Super Hornet does not have any compelling advantage in EWSP capability. Computing capability in operational Flankers is mostly provided by legacy Russian hardware, but with some COTS (Commercial Off The Shelf) processors now appearing in radar upgrades and missile seekers. 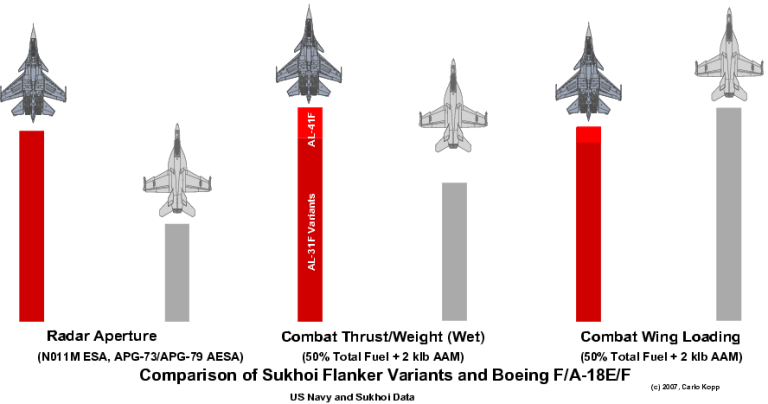 While this is an area where the Sukhois are barely competitive against the current Super Hornet, it is the easiest of all of the performance gaps for the Russians to close. In summary, the Flanker outperforms the Super Hornet decisively in aerodynamic performance. What advantage the Super Hornet now has in the APG-79 radar will vanish in coming years as Russian AESAs emerge. The one area in which the Flanker currently trails the Super Hornet is in radar signature (stealth) performance. The Super Hornet has inlet geometry shaping, inlet tunnel S-bends, and an AESA shroud all of which reduce its forward sector signature well below that of the Flanker. In the short term, this is an advantage the Super Hornet retains, with the caveat that external stores put hard limits on signature improvement for the Super Hornet. However, Russian researchers have done some excellent work over the last decade in absorbent materials and laminate techniques for radar signature reduction, which offer the potential for the Flanker to achieve similar signature reduction to the F/A-18E/F. If funded, a reduced signature Flanker is feasible in the next half decade. In conclusion, the Flanker in all current variants kinematically outclasses the Super Hornet in all high performance flight regimes. The only near term advantage the latest Super Hornets have over legacy Flanker variants is in the APG-79 AESA and radar signature reduction features, an advantage which will not last long given highly active ongoing Russian development effort in these areas. 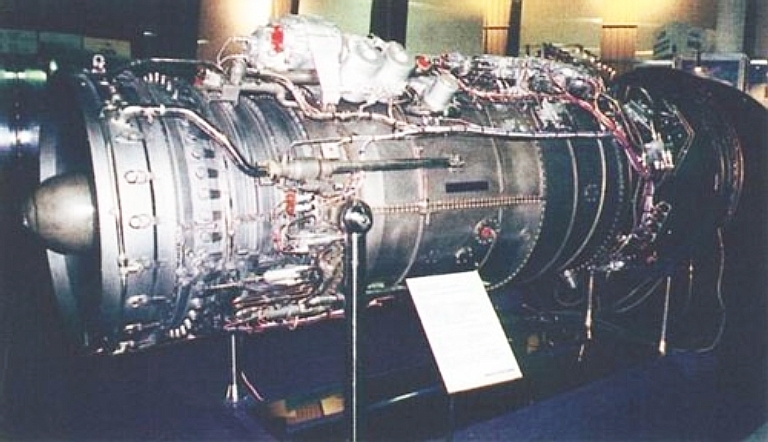 The supercruising Al-41F engine will further widen the performance gap in favour of the Flanker. What this means is that post 2010 the Super Hornet is uncompetitive against advanced Flankers in BVR combat, as it is now uncompetitive in close combat.